Annie's Dandy Blog: Where do I begin? It has been an... interesting week, to say the least. I'm not sure where to start. So many times during the past week I was going to start writing about something of interest, but then something else happened and then I'd think, hey, that sounds interesting too, maybe I'll write about that instead. Where do I begin? I've begun this blog a thousand times in my head. Both good and bad things have happened to me this week. I won't say which weighs on my mind more, good or bad - you can guess for yourself! 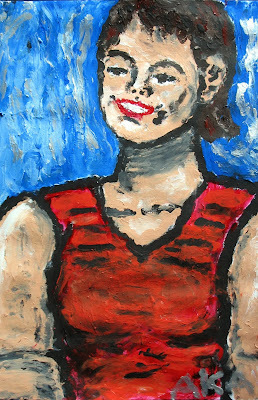 Well, first, I did a portrait of my good friend Nora for her birthday. Happy birthday, Nora! Yay, Nora! Yay, art! I love it when my artwork pleases someone and makes a difference in their lives. On Wednesday morning, Lenny and I went to speak to a class at the YMCA Academy. The kids were all very inquisitive and great! 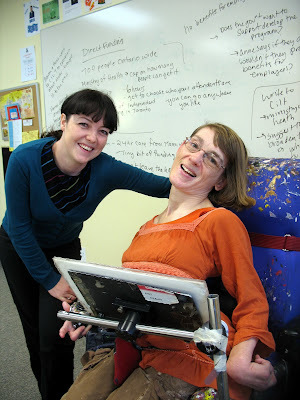 I spoke about what it's like to have a disability in Ontario, Canada. When you're on ODSP, I explained, you're trapped forever in poverty with no hope of escape. You only receive a small monthly amount, and then, if you get anything extra from other sources, which is rare, it's counted against you the following month. So, you can never get ahead, let alone choose a better place to live. I also told the class how Direct Funding works, how only 700 people with disabilities in Ontario can receive this specialized funding. Despite the fact that most 24 hour attendant services are shown to be abusive (this is why I got out of them!) and that thousands of people are on the waiting list for Direct Funding so that they can choose and hire their own personal assistants, the Ministry of Health has put a cap securely on this type of funding. Seven hundred people in Ontario, and that's all. Unless someone dies or goes off the program, no one else can get Direct Funding. Like I said, the kids were very inquisitive, and they asked what they could to do to help me, and people like me. I suggested that they write to the Ministry of Health and to their Member of Parliament outlining the aforementioned problems. I also asked them to spread this information amongst their families and peers. Ignorance, I said to them, is our biggest problen. I felt good about talking to the class. It was a small but positive step in the quest for better services for people with disabilities. I also felt good when I received an email this past week for an order of my note cards. Hell, I felt awesome! The guy said that he was from Australia and that he wanted to buy $2,000 worth of cards from me. I didn't think that this sounded too suspicious - I mean, people are supposed to find my website and buy my artwork, aren't they? I thought that maybe he owned several stores in Australia, which could explain the large order. I was so good, paying close attention to detail so that my customer would be happy and satisfied. I counted my cards to see if I had enough for the order, I went to the postoffice to find out exactly how much it would cost to ship the cards, I sent him a detailed invoice and directed him to my Paypal account. The beginning of financial independence was within my sights, and I was so incredibly happy! And then, it all came down like a house of cards. It was a scam - a nasty, mean-spirited scam! I knew it as soon as he asked me to pay for the shipping. And then, Rob looked up scams like this, and there was this guy's name, big as life and twice as ugly! What's wrong with people?????????? Here I am trying to make the world a better place, and there's jerks like this guy trying to scam people out of their hard earned money! Jeez! As Roy from The IT Crowd would say, "People: what a bunch of bastards!" That's awful!! I second your "What's wrong with people??!!!!". I know you probably can't post this guy's name (legal stuff and all that), but perhaps you could post the link to wherever you looked him up? That way we can all be a little wiser. Hello from Indiana! This is Barry, I have spoken with you a few times at St. Laurence Market (curly hair?). So sorry to hear about the scam artist. It's hard to believe that there are actually people like that in the world. If it makes you feel any better, there are a whole bunch of young folks in central Indiana who's lives have been made better by your artwork and your unquenchable spirit!